Under LB339, introduced by Henderson Sen. Curt Friesen, the state Department of Aeronautics will merge with the state Department of Roads, effective July 1. The combined agencies will be renamed the Nebraska Department of Transportation. The newly formed department will be administered by the director-state engineer for the state Department of Transportation. This position will be filled by the current director-state engineer for the state Department of Roads. Any person hired to serve as the director of the aeronautics division within the department will require legislative confirmation. Lincoln Sen. Mike Hilgers introduced LB271, passed 48-0, which authorizes the Nebraska Department of Roads (NDOR) to assume responsibility to conduct environmental, social and economic reviews for proposed transportation projects from the U.S. Department of Transportation. The reviews currently are conducted at the federal level under the National Environmental Policy Act (NEPA). In exchange for assuming total responsibility for the review process, the NDOR will sign a limited waiver of sovereign immunity, which provides the state’s consent to federal jurisdiction in any case concerning compliance with and enforcement of federal guidelines established under NEPA. LB584, introduced by Friesen, prohibits counties and townships from mowing ditches before July 1 each year. The bill does not prohibit private landowners from mowing roadside vegetation on road shoulders, intersections or entrances. Landowners will be required to mow roads and drainage ditches at least twice annually, in July and September of each year. 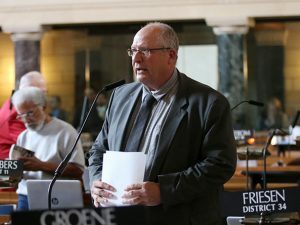 Kearney Sen. John Lowe introduced LB346, passed 47-0, which eliminates the requirement for a person to obtain a motor vehicle, motorcycle or trailer salesperson license from the Motor Vehicle Industry Licensing Board. Senators also passed a bill that requires the state Department of Motor Vehicles (DMV) to design and make available license plates with a “choose life” theme. “Choose life” licenses plates were authorized under LB46, introduced by Syracuse Sen. Dan Watermeier, and will be available Jan. 1, 2018, for an additional $5 for an alphanumeric plate or $40 for a personalized message plate. The state Department of Health and Human Services’ Temporary Assistance for Needy Families program will receive 75 percent of the registration fee and $5 of the application fee. The bill passed on a 35-5 vote. Watermeier also introduced LB45, passed 46-1, which extends eligibility for military honor license plates to people who serve or have served on reserve duty. Active duty service people and honorably discharged veterans currently are eligible to purchase the license plates. Reservists serving in the United States Navy, Marine Corps, Coast Guard, Air Force and Army are eligible under LB45. The bill contains provisions of LB419, introduced by Omaha Sen. John McCollister, that further extend eligibility to current and former commissioned officers of the United States Public Health Service and National Oceanic and Atmospheric Administration. A bill aligning population thresholds for annexation was sponsored by Bellevue Sen. Sue Crawford. LB74 provides for a review of proposed subdivision plats and approval of planned unit developments for counties with a population between 100,000 and 250,000. Lawmakers passed an omnibus bill that contained provisions of several transportation-related bills. LB263, introduced by the Transportation and Telecommunications Committee, requires the DMV to create an electronic dealer services system. The system will allow dealers to provide titling and registration services following the sale of a vehicle, in addition to collecting title and registration fees, sales taxes and motor vehicle taxes. Any car dealer participating in the electronic dealer services system can charge a service fee of up to $50. The bill also allows the owner of a motor vehicle that is more than 30 years old to apply for issuance of a title when no major component parts have been replaced and the DMV shows no record of a previously issued title. A title can be issued following presentation of a notarized bill of sale, completion of a title inspection and payment of a $25 fee. • LB483, introduced by Hilgers, which provides to the PSC an exemption from the Nebraska Administrative Procedures Act for purposes of granting or denying a petition for intervention. Finally, senators considered a proposal to repeal a current state law that requires motorcycle and moped riders to wear a protective helmet. Lowe introduced LB368, which would give riders 21 and older the option to wear no helmet but would require that eye protection be used. The bill also would prohibit children younger than six years of age from riding a motorcycle or moped. After six hours of debate spanning several days, Lowe offered a motion to invoke cloture — or cease debate and force a vote on the bill. The motion failed on a vote of 32-12, one vote short of the number required.